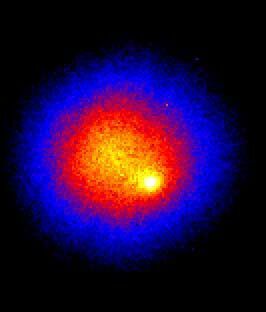 The faint tail of Comet Holmes detected in near-infrared Oct. 26, 2007. A comet that has engaged skywatchers worldwide with its sudden outburt has had one disappointing aspect: no tail. Comet Holmes brightened suddenly and dramatically last week, going from total obscurity to naked-eye brightness that rivaled some of the brighter stars in the sky. But without a tail, the gas and dust ejected by the comet left it looking like no more than a fuzzy tennis ball through backyard telescopes. Now astronomers think they've found a hint of a tail. Don't expect to see it for yourself, however. A new image made using near-infrared light, which humans can't see, shows a small, tail-like feature next to the comet's nucleus. The image was obtained by graduate student Sandie Bouchard and assistant Bernard Malenfant on the pre-dawn hours of Oct. 26 using the Ritchey-Chretien telescope at Mont Megantic Observatory in Canada. A preliminary analysis, performed by astronomers Pierre Bastien and Rene Doyon from University of Montreal and the Centre de Recherche en Astrophysique du Quebec (CRAQ) clearly shows a bright elongated feature. However, the direction of the feature does not point directly away from the sun, as expected. Comet tails are formed when pressure from sunlight pushes inexorably on the material in the head, which surrounds the solid nucleus. This material—gas, dust, and ice particles—is typically pushed away from the sun to form the tail. Astronomers don't know why the outburst occurred. Comet Holmes has been known for more than a century but has been quiet for decades, visible only through powerful telescopes.